The search for extrasolar planets (or exoplanets) had its first success in 1991 with the discovery of some planets orbiting around the pulsar PSR1257+12(1, 2, 3), measuring the variations of the radio pulses coming from the star. 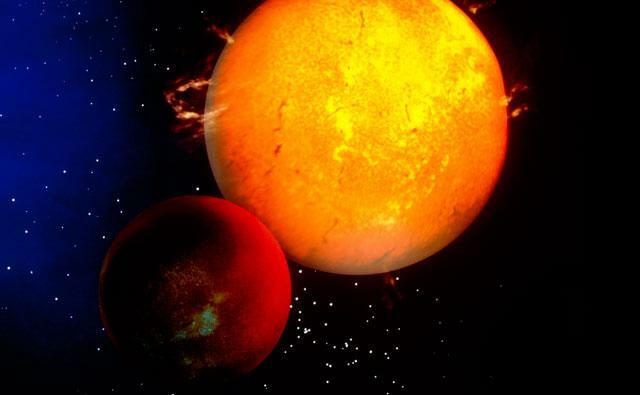 The second important milestone in exoplanet research takes place in 1995, with the discovery around the star 51 Pegasi (a star like our Sun) of a Jupiter-like planet, found at a distance closer than Mercury's orbit in our Solar System(4). 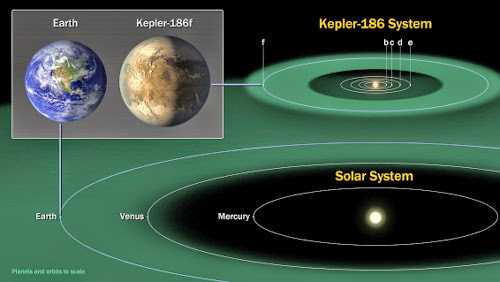 These initial discoveries, and many other up to 2009(5, 6) were made using the method of radial velocity or Doppler oscillation, in practice it is assumed that the radial velocity of a star is affected by the presence of a planet orbiting the star itself. 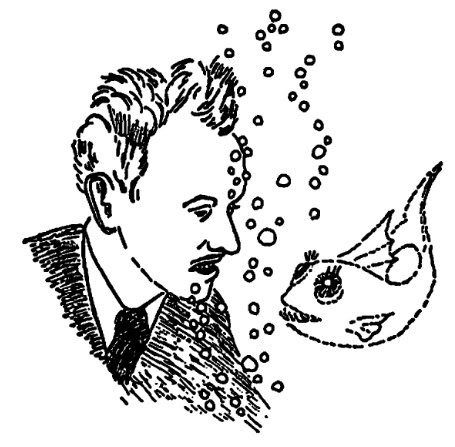 In this way, the frequence from the star will be blue when the planet moves in its orbit toward the Earth, tending to red when the planet moves away(7). With the radial velocity, however, is rather difficult to determine the exact orbit of a planet (or at least something that comes close), and then effectively allows us to determine the period of rotation around the star and the orbital eccentricity (i.e. the deviation by a circle) of the orbit of the planet itself. And I must remember that the method is effective especially for massive planets. 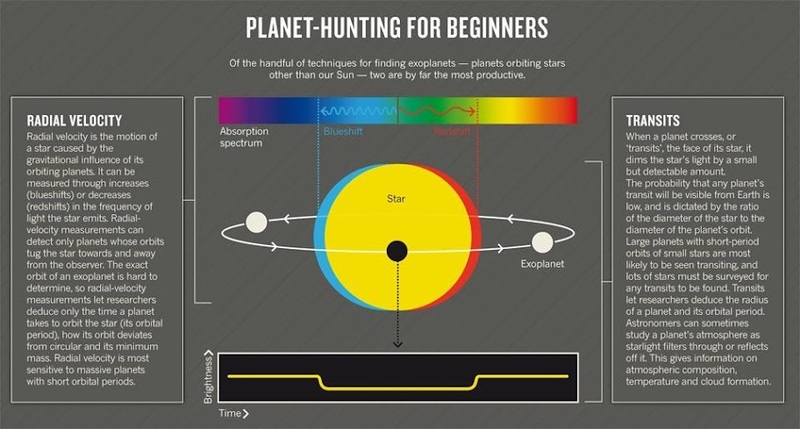 Luckly, the transit method is a more effective method to discover and study exoplanets: it is based on the examination of the light emitted by the studied star and it is considered by Dimitar Sasselov(8) the method of observation more fruitful: when this light decreases, this means that the star is passing in front of an object. In this way it is possible to determine the radius of a planet and its orbital period. Using essentially the same tools used for the detection of the planet, it is also possible to study the atmosphere of the planet itself, determining its composition, temperature and the presence and formation of clouds. The research about Kepler-11(9) is interesting because, in addition to combining the data for the studied system, it also collects information on a particular planet, Kepler-11g, and also offers deductions, based on the data, about the composition and formation of the planetary system, thus providing, as well as a number of interesting scientific data, a good example of the potential of the mission in general. He was born in Klušino on the 9th March, 1934; he died on the 27th March 1968, in a plane crash. His death and the controversy that followed and especially the pioneering gesture for which I remembered him today, make me pull over to Hal Jordan, a comic book superhero. 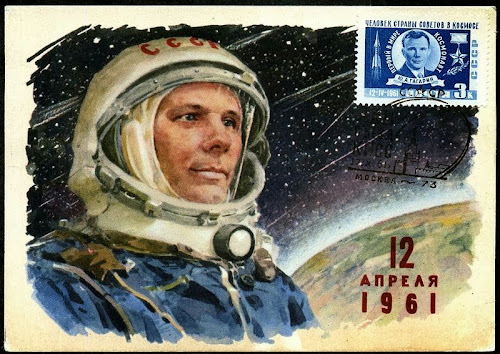 In fact, Yuri Alekseevich Gagarin, when he returned home from his space mission, was celebrated as a hero, as a man who was raised on humanity in all its stature: the 12nd April 12 1961 he had become the first man to go in space, completing one orbit around the Earth. The recent claimed observation of primordial gravitational waves provides a dramatic new empirical window on the early universe. 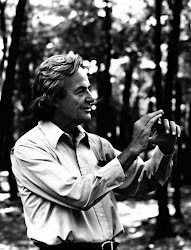 In particular, it provides the opportunity, in principle, to de nitively test the inflationary paradigm, and to explore the speci c physics of inflationary models. However, while there is little doubt that inflation at the Grand Unfi ed Scale is the best motivated source of such primordial waves, it is important to demonstrate that other possible sources cannot account for the current BICEP2 data before definitely claiming Inflation has been proved. Finally we note that while current data cannot de nifitively rule out a SOSF transition as the source of gravitational waves, it nevertheless does imply that the source for such waves is at, or near the Grand Uni ed Scale. Thus, it allows an exploration of physics at a scale far larger than we can currently constrain at terrestrial experiments. This will be very important for constraining physics beyond the standard model, whether or not inflation is responsible for the entire BICEP2 signal, even though existing data from cosmology is strongly suggestive that it does. 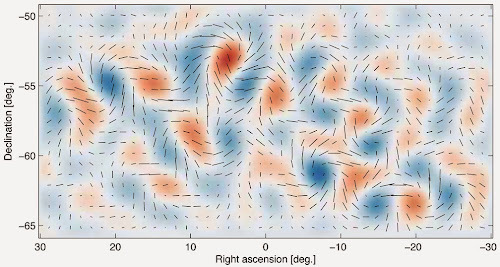 A Nearly Scale Invariant Spectrum of Gravitational Radiation from Global Phase Transitions, Probing the Gravitational Wave Signature from Cosmic Phase Transitions at Different Scales, and Gravitational waves from self-ordering scalar fields. Here, after a lecture, Richard Feynman plays his signature "Orange Juice" theme with his friend and fellow drum player, Ralph Leighton.